Rostock was once one of the primary ports of the powerful Hanseatic League. Satisfy your inner culture vulture at Schwerin Castle (Schweriner Schloss) and Warnemunde Church. Get in touch with nature at Warnemunde Beach and The Mollie Steam Train. Explore Rostock's surroundings by going to Kirche St. Georgen (in Wismar) and Staatliche Museum Schwerin (in Schwerin). The adventure continues: see the interesting displays at Stasi Pre-Trial Prison, don't miss a visit to Standehaus, and take in the architecture and atmosphere at Sankt Marien Kirche. For ratings, more things to do, photos, and more tourist information, go to the Rostock trip itinerery planner. In August, plan for daily highs up to 26°C, and evening lows to 15°C. Finish your sightseeing early on the 16th (Tue) so you can travel to Stralsund. Set on the Baltic Sea across from the island of Rugen, Straslund has for centuries focused on fishing and shipbuilding industries. On the 17th (Wed), pause for some serene contemplation at St. Marienkirche, then examine the collection at Museumshaus Stralsund, then stroll through German Oceanographic Museum (Deutsches Meeresmuseum), and finally steep yourself in history at Stralsunder Rathaus. On the next day, take a tour of Gorch Fock I, pause for some serene contemplation at Nikolaikirche, and then admire nature's wide array of creatures at Ozeaneum. To see other places to visit, photos, where to stay, and other tourist information, read Stralsund vacation builder. Explore your travel options from Rostock to Stralsund with the Route module. Plan for somewhat warmer nights when traveling from Rostock in August since evenings lows in Stralsund dip to 19°C. Finish up your sightseeing early on the 18th (Thu) so you can travel to Ostseebad Binz. 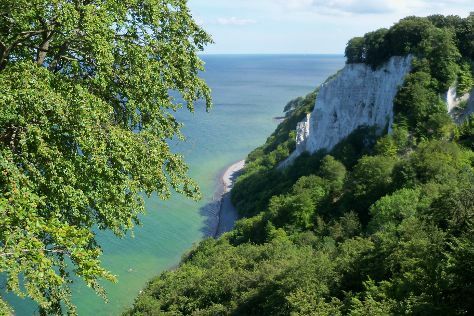 Get outdoors at Naturerbe Zentrum Rugen and Nationalpark Jasmund Konigstuhl. Do some cultural sightseeing at Kreidefelsen and Jagdschloss Granitz. There's much more to do: take in the views from Footbridge, don't miss a visit to Seebruecke, admire the striking features of KdF - Koloss von Ruegen, and enjoy some diversion at Karls Erlebnisdorf Zirkow. For other places to visit, photos, ratings, and more tourist information, read Ostseebad Binz trip itinerary maker. The Route module can help you plan travel from Stralsund to Ostseebad Binz. Expect a daytime high around 26°C in August, and nighttime lows around 19°C.